We are going to make several projects, each using a new technique. You will learn measuring & marking, french seams. bias binding, putting in a zipper, lining & top stitching, and bag handles. The price for the entire class also includes the instruction book. When you come to class you will only pay for the kit for that day. Each week will be a different project, so each week will be a different kit fee. We will keep that kit fee to a minimum. 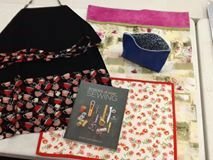 We will be sewing a pillowcase, zipper bag, apron, placemat, and a tote. You may bring basic sewing notions such as scissors, pins, etc. We have all notions needed if you need to purchase anything. You will need to bring your sewing machine in good working order or arrange to use one of our classroom machines. Instructor fee & Instruction book.